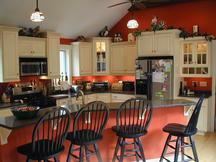 The kitchen has become the focal point of many homes today. 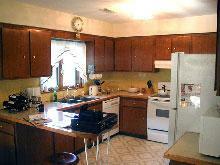 It is the place where families often gather as they try to manage the hectic lifestyles of today. P. & R. Boucher has the resources to take your ideas from conception to completion in a comfortable, professional manner that will produce dramatic results and years of enjoyment. With computer aided design, they are able to show the client a realistic representation of what the finished project may actually look like.Now adesign change will not take as long to reproduce allowing the project to move more efficiently with fewer delays.Working with a range of cabinet manufactures, they can meet virtually every need, from classic designs to contemporary flair. 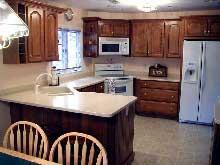 A sink facing where people sit allows the owner tointeract with the guests while working. A column can be a structural elements as well as part of the design. 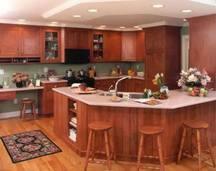 Creating separations between rooms can be in the form of a taller cabinet or a peninsula. 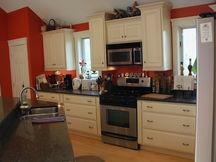 Appliances in the corners opens the work zones so you have larger prep areas. A functional kitchenneeds plenty ofstoage and a landing place for stuff as you enter the room. 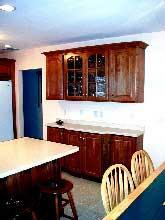 Details in the cabinets can be on doors of prominate cabinets. Express yourself in the design, layout and choice of products. If you tire of paint in 5 years it's not a major cost to change. 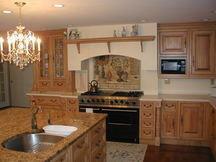 Taking cabinets and setting them at different heights and depths creates a detail that adds to the visual effects.